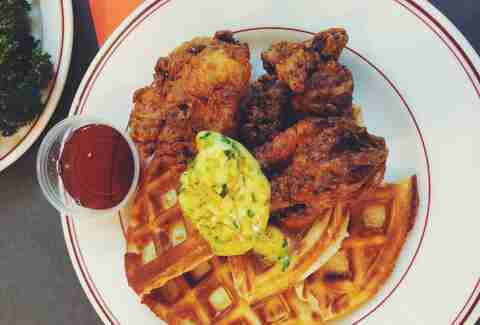 Though chicken & waffles likely started in Harlem and has undeniable ties to the South, you’d be hard-pressed to find somebody who wouldn’t agree that LA is prominent in the dish's current scene. We take ‘em seriously -- it’s a matter of pride. Where can you attain this legendary combination, you ask? A whole lot of places, but here are the best of the best. 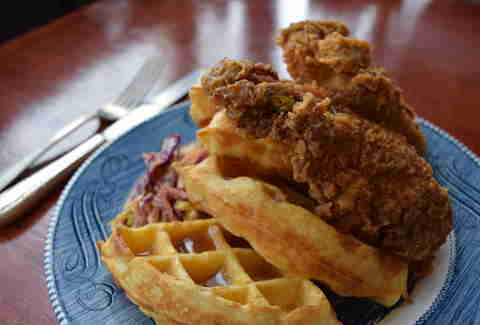 OK, it’s not exactly a waffle, but Plan Check’s fried chicken & cruller is a thing of beauty. You’ll get some of Plan Check’s rightfully famous smoky jidori chicken and a pretty sensational maple bacon cruller. Don’t start sprinting over there yet, though -- you can only get it during Plan Check’s Sunday brunch from 10am to 2pm. Because the people behind this not-Japanese restaurant in Little Tokyo are genius wizards, they fold waffles around fried chicken like little tacos. And cover them in syrup. And powdered sugar. Genius wizards. Straight from Nashville, this hot chicken landmark has been absolutely crushing it in Chinatown since opening. Take the spicier road for brunch (all day Saturday & Sunday) with some hot chicken & waffles (also available in sandwich form). Oh, and bring a book or a podcast, because you’ll be waiting in a hefty line to get your fix. 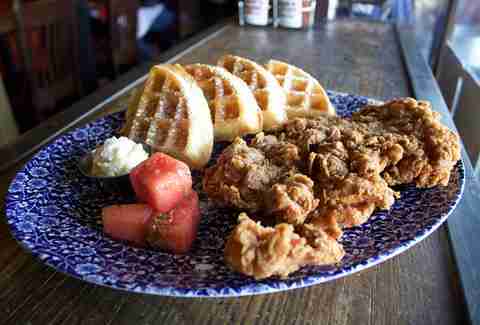 Due to a fiercely loyal fandom, a lot of people will rank the plain-and-simple chicken & waffles at the Fox even higher than Roscoe’s. We’re not ready to say who is right, but we are ready to say that Hungry Fox knows exactly what it's doing. Join the debate and head over there yourself, eh? Gus’s has long been a local fave thanks to the perfectly golden chicken coming out of its fryer. 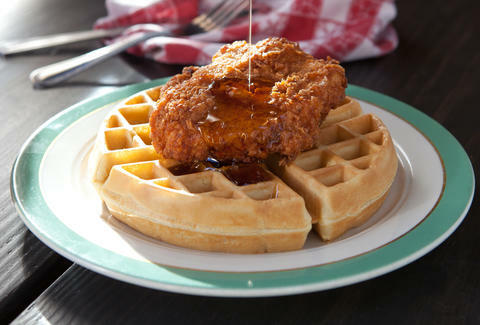 You’ll see that same gold in the waffle (before you’ve slathered it in maple syrup of course) served with said chicken. 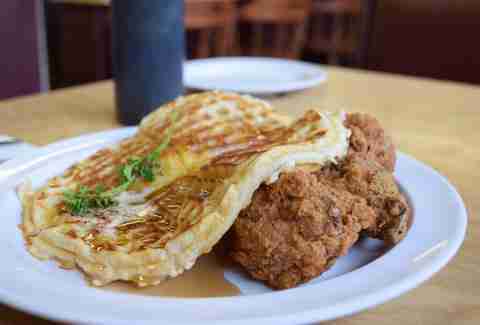 We give Gus’ golden chicken & waffles a gold medal. Bruxie’s whole jam is creating delicious sandwiches out of waffles, so you can choose from four different chicken options. Your choices range from the Original (fried chicken, chili honey, and cider slaw), Nashville-Style (hot chicken, tangy sauce, shredded lettuce, and pickles), Buffalo Bleu (buffalo chicken, veggie slaw, blue cheese crumbles, chives, and ranch dressing), and the not-fried Grilled California Pesto (grilled chicken, herb goat cheese, arugula pesto, sun-dried tomatoes, and arugula). Get some waffle fries on the side, just to complete the experience. Let’s get this one out of the way because, let’s face it, we’d be run out of town if this soul food institution weren’t on here. Choose your favorite parts of the bird (which are fried in a cast-iron skillet to a deep, satisfying brown), wrap 'em in a waffle that's doused in syrup/a scoop of butter, and enjoy. Like, a lot. Comfort LA is as close to a literal hole-in-the-wall as you can get, and it has been murdering the fried chicken game since it opened. 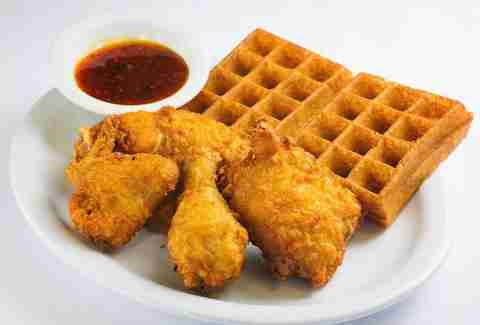 During Sunday brunch, which lasts all day, you can get your mitts on the chicken & waffle special (five wings and two waffles) for only $10. While that might sound like plenty of food, you should still accompany that with a side of collards. You’ll be quite happy you did. If you can get over the name, you’re truly in for a treat. 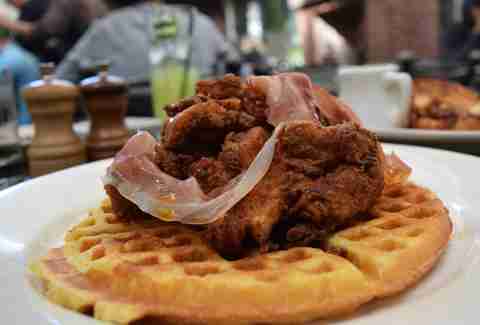 Qrious specializes in waffles, so there’s about a hundred different ways you can get your chicken & waffles on. Feelin’ a sandwich? 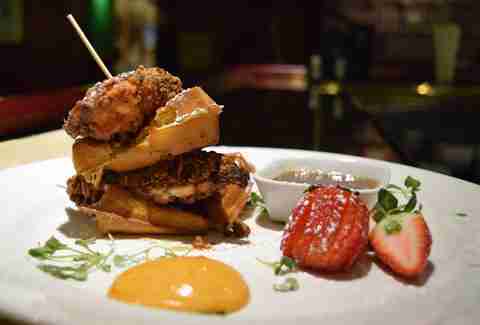 Go for the Chicken Waffle, with fried chicken, coleslaw, and spicy syrup. Feelin’ a plate? You can choose between wings, spicy wings, and strips. Not Korean enough for you? Weird request, but they’ve got Korean-style and bulgogi as well. 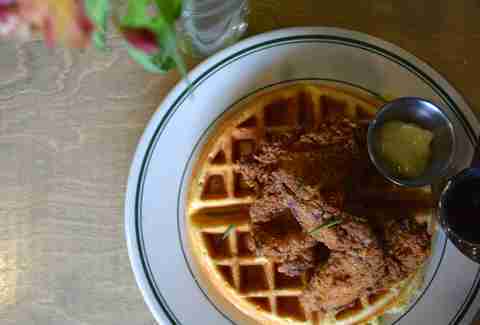 Beat the brunch crowd for a seat on the patio at this modern/rustic spot and dig into the buttermilk fried chicken and oh-so-fluffy waffles that get a drizzle of Tabasco-maple butter. Also: bottomless mimosas. 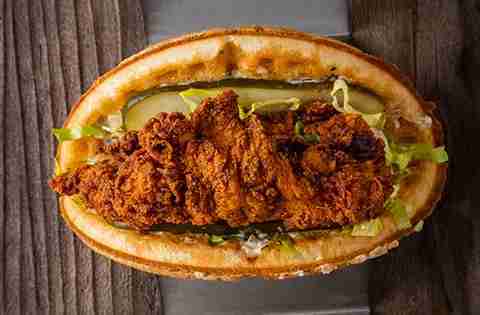 At this Southern-style Venice brunch staple, TV-vetted chef Govind Armstrong hits you with the one-two punch of expertly fried organic chicken and a fluffy/crisp waffle served with the welcome heat of chili maple syrup and spot-on slaw. Again, get the biscuits. And the house-made multi-chili hot sauce. 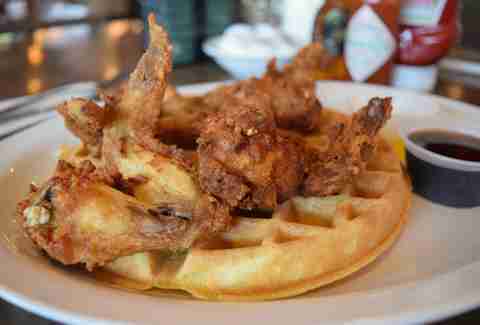 This super-friendly family-run spot is up to some serious good in Inglewood with its chicken/waffle combo. 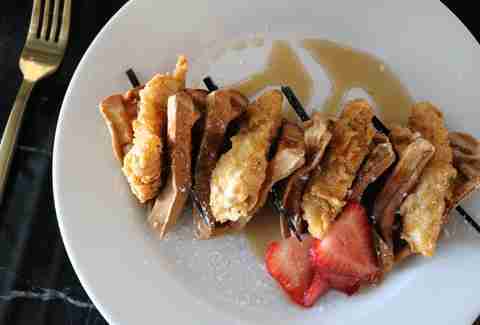 The flaky-peppery crust encasing juicy and meaty chicken is the type you stare at in awe as you anticipate your next bite, and the crisp-yet-spongy waffle delivers. Pro tip: yes, you definitely want the cinnamon on your waffle. Pro-er tip: stop by for The Cookie during the new late-night weekend hours after a show at The Forum (Fri-Sat, 10pm-5am). Even if you have no intention of using the stunning chandelier-topped pool, or working out at all, we seriously recommend that you become (or befriend) a member of this historic athletic club (or sneak in), if only for the stacked chicken & waffles. Applewood bacon-infused waffle? Check. Crisp buttermilk-fried chicken breast with chipotle aioli? Double check. Though an upscale departure from the classic, this dynamic culinary duo drops some heat with a house-signature spicy Spanish fried chicken that’s balanced by a mildly sweet and crunchy cornbread-like waffle... and then topped with thin strips of cured jamón. Uh. Huh. The house specialty at this genuine '50s diner is refreshingly simple: a sweet and sturdy Belgian with crisp, tender wings. The melted butter and warm syrup are just icing on the, er, waffle. Pull up your leather chair, put your pinkies up, and swankily dig into these crispy birds, spicy syrup-doused waffles, and thick-cut, hickory-smoked bacon. You're given the option (hahahahahaha) to have your crisp Belgian waffle stuffed with bacon. So, uh, do that, and make sure to dip your waffle (and the accompanying crunchy and meaty fried chicken) into the side of gravy. Oh right, and before you make sure to do that, make sure to get there early for brunch or risk missing out/waiting in line/waiting in line and then missing out. Thankfully not just a pile of Schrute-farmed beets, Dwight’s Special sticks to the classic fryer/griddle combo, and holds its own against the other exotic waffle variations on the menu. Okay, a boneless breast is a bit unorthodox, but, 'cmon. 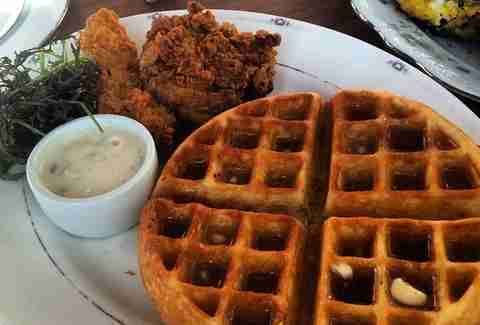 Because sometimes you aren’t satisfied with stuffing your face with just one type of farm animal, these sustainable meat purveyors will dish you up dense hunks of buttermilk-dredged, chicken-fried rabbit along with crunchy waffles, orange-parsley butter, and certified maple syrup. Yes, you came here for a slice of bourbon pecan pie. Yes, it's 2am. 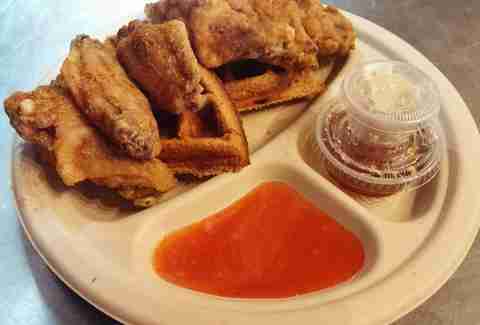 And yes, you will now also order the corn flake and almond-crusted chicken tenders and Belgian waffles. You’re welcome. Danny Jensen is a regular Thrillist contributor and has no objection to combining fried chicken with waffles on a regular, if not daily, basis. Cluck at him on Twitter and Instagram. Wilder Shaw is a regular Thrillist contributor who will dump equal amounts of hot sauce and syrup on his chicken and waffles. Tell him what a genius he is on Instagram and Twitter.